A beautiful, mature elm tree was downed this morning in front of Andy’s Chinese at 128 Montague Street, when an oversized truck attempted to make a left turn from Montague Street onto Henry. Local fire department crews responded and removed much of the debris by noon, with police tape wrapped around the trunk and remaining brush. 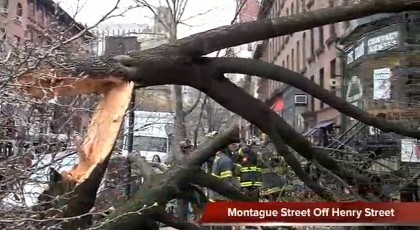 See Karl Junkersfeld’s fantastic on-the-scene coverage in this 2-minute video here (also embedded below the jump), which revisits other trees that Brooklyn Heights has lost, in addition to footage immediately after today’s cataclysm. It appears that no one was injured nor were any vehicles damaged: The tree fell toward retail on Montague—miraculously with no windows broken. 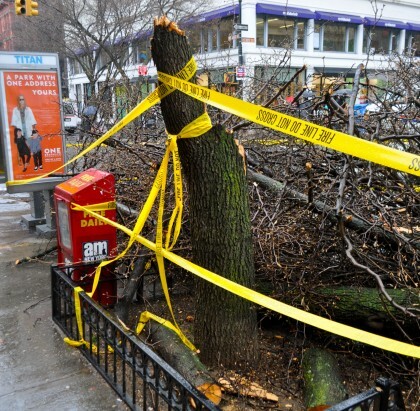 This, of course, hearkens the Height’s most recent loss of the neighborhood’s natural beauty, when an American elm fell during Hurricane Irene at the Mansion House (145-153 Hicks Street) last August. Speaking of things about to fall over, has anyone noticed the large pole outside of the Key Foods on Monatgue swaying in the wind. It looks like it may succumb to the same fate. Didn’t we recently lose the tree just east of there? “Johnny-on-the-spot” Karl J. Thanks for the great video. How do you manage to be in the right spot at the right time all the time? Excellent video, but I wouldn’t show it to anyone who works in the legal dept at the BBC…. Doesn’t the dang fool truck driver realize that he’s pushing into the tree and stop his forward movement? Is there a fine/ticket that goes with this? The driver was detained by police. Not sure of the consequence. And lois, I just happened to be on the corner when all hell broke lose. Unfortunately, I didn’t have my camera and had to go home to Middagh and Hicks to get it. 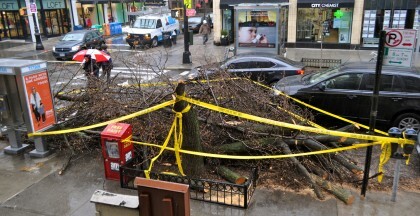 Not a good last few months for elms in Brooklyn Heights. That was a Callery Pear tree, not an elm. 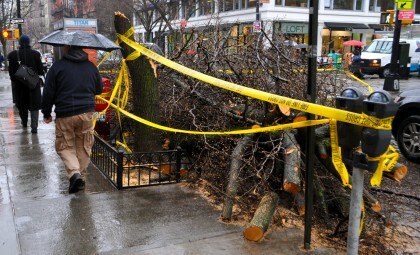 It the NYPD managed to take a detailed enough report of the accident, providing the necessary driver and truck identification, the Parks Department has a process for seeking compensation ($) based on the size of the downed tree. Yes, the tree next to (“east of”) this one was also felled by a truck about a year ago. Can commercial traffic (except for local deliveries) be banned from the Brooklyn Heights Historic District? It could, but I don’t think there is enough of a problem for that, and I don’t see a lot of commercial traffic taking Monatgue, or the rest of the hood as a shortcut. Most commercial drivers wouldn’t want to have to navigate the streets unless they had to. Clinton is about the only street I see trucks on, and that is only because of its access to Tillary. A pear tree makes more sense. An elm may have ripped the truck in two. If anyone recalls, last year the exact same thing happened in front of 132 Montague Street where my optical shop is. A large truck backed up and took down a big tree…pretty much the exact incident that happened here the other day. It’s really a shame to see two big old trees lost to a truck drivers carelessness. Maybe there should be a size limit on trucks accessing historically zoned neiborhoods.